A Practical Guide to Writing a Ruth L. Kirschstein NRSA Grant provides F-Series grant applicants and mentors with insider knowledge on the process by which these grants are reviewed, the biases that contribute to the reviews, the extent of information required in an NRSA training grant, a deeper understanding of the exact purpose of each section of the application, and key suggestions and recommendations on how to best construct each and every section of the application. 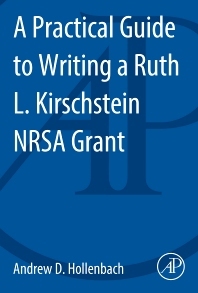 A Practical Guide to Writing a Ruth L. Kirschstein NRSA Grant is a solid resource for trainees and their mentors to use as a guide when constructing F30, F31, and F32 grant applications. Predoctoral students (both Ph.D. and M.D. /Ph.D.) and postdoctoral researchers that are eligible to submit a Ruth L. Kirschstein NRSA training grant as well as their mentors and advisors.